There's been some chatter about restricting some subset of Mental Misstep, Gitaxian Probe, and Gush. I wonder if it'd be possible to print some hate cards that slightly reduce their viability instead. One option is a Trap mechanic - an instant card with a powerful effect but high casting cost, where the trap triggers when your opponent plays a card without paying mana. But this is really hard to get right - it has to be good enough to discourage Gitaxian Probe, but not so good that it makes Force of Will unviable. T: Until end of turn, you may cast target instant or sorcery card in an opponent's graveyard. You may not use mana to pay the card's casting cost. If you cast the card, exile it. I think this would make for quite interesting in-game decision-making and interactions. When your opponent has Force of Will in his graveyard, any decision to tap Hate Island, whether for mana or whether to cast your opponent's Gitaxian Probe, becomes a weighty one. A skilled opponent can play through the hate with good planning, timing, and bluffing. Snapcaster and delve make for interesting situations. An alternative is to make it target instants and sorceries with converted mana cost 1 - that limits the hate to Probe/Misstep and not Gush/FoW/Mindbreak Trap, but also then hits the card draw package of Ancestral, Ponder, Brainstorm, Preordain. I think I prefer the level of skill and interaction that would arise from being able to target Force of Will, but targeting card draw instead might have its merits. Wappla answered correctly. The legendary land would just be used in a deck itself running all these cards. 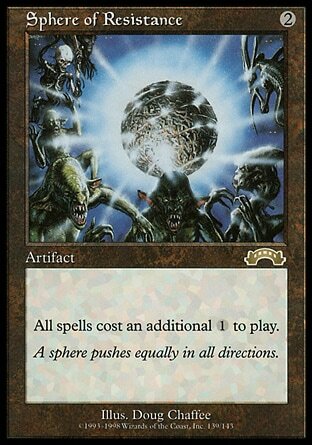 Spheres and friends are a much better solution to decks relying on the Turbo Xerox manabase. 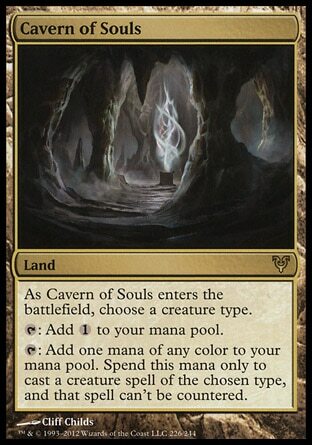 I personally find it hilarious that the proposed answer to problematic blue cards would be be a blue mana-producing land. So absurd. That said, Wizards would probably love it. The bias towards blue makes perfect sense in a game created by nerdy people without any perspective. They label it the color of the mind or intellect and I can hear them thinking, "Intellect should be the most superior attribute because I'm think I'm smart and I want that to be the most important quality for a person to have." I guess if the game had been made by hippies, then maybe green would be the best color. And goth inventors would've chosen black, naturally. I think some of these responses miss the point. Some expert players are suggesting restricting Mental Misstep and/or Gitaxian Probe, and it's not because those cards are so good against Thorn/Thalia decks. It's because Misstep and Probe make the blue-vs-blue match less interesting. If the problem to solve is a detioration of blue-vs-blue gameplay, the answer should be to give blue decks an answer that discourages the playing of those cards. That's why I propose this hate card as a blue card. @dshin I think you might have it backwards. Gitaxian Probe and Misstep (and Gush) already are cards that blue decks run that are good against each other but not particularly great against nonblue decks. Printing yet another card that is good in blue decks against blue decks is doubling (quadrupling?) down on that phenomenon, not eliminating it. Or to put this another way ... What would happen if Wizards printed a hate card that got better the more free spells your opponent was running? This. This metagame is what happens when they do that. The idea that the format needs to better support Blue vs. Blue gameplay is not something I can get behind. It kind of offends me (but to clarify, I'm not mad at any forum poster). There is a lot that is fun about Vintage, but at the same time Vintage is where you go to see many of the hideous mistakes made by game designers. Broken cards will, of course, happen and require restricting (or answer cards). But the game's designers have effectively broken an entire color. 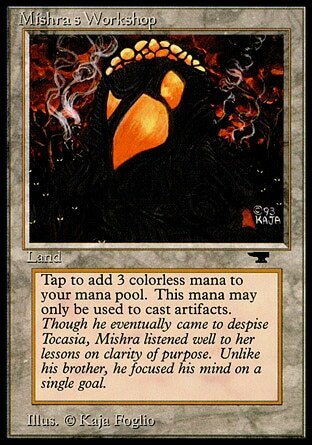 When you feel the need to restrict Ponder, that tells you something about how one color has the vast majority of meaningful card selection and card advantage. Dig, Cruise, Delver and both good Jaces particularly disappoint me. They gave Blue a 3/2 flyer for one mana. According to that reasoning Red should get a 3/3 first strike haste for one mana (Swiftspear is close), and green should get a 3/4 hexproof for one mana (Tarmogoyf is really a blue creature). I'm not saying blue has the only imbalance in Vintage. 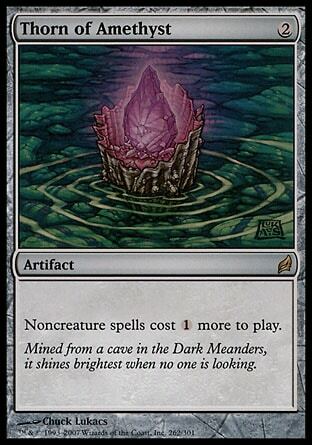 When we talk about creatures, White and Colorless (Artifact/Eldrazi) have gotten boosts, too, above and beyond Green, Red and Black..
And I know that little effort is spent at WOTC on Eternal Formats. But it would be very easy to print cards in Black, Green, or Red that impacted the Legacy and Vintage meta without being easily slotted into a random blue deck. Apparently I wasn't finished my rant. Apologies. A green Chill effect would be really nice. Their is notion theif and leovold to stop draw, but they are blue as well. We just need a Underworld dreams that costs 1B. @Brass-Man The phenomenon I am trying to reduce is uninteresting blue-vs-blue gameplay. I don't see why the printing of a card that is good in blue decks against blue decks axiomatically must fail to achieve this. The property of Gitaxian Probe that makes it bad for gameplay is that it makes the game more perfect-information. That it is better against blue than non-blue is secondary. Uninteresting blue vs. blue gameplay is the appropriate punishment for everyone playing blue all the time. It's not the cards you mentioned, it's the fact that there are so many blue vs. blue matchups. Is it really going to be different if it becomes 4 Flusterstorm, 4 Preordain and 4 Thirst for Knowledge? I agree that Probe is problematic, but like you said there are more nuanced reasons--skill-reducing perfect information at a negligible cost. It also finds play in many combo decks (Pitch Dredge and DPS in particular). @jhport12 I understand your frustration with blue. If I could redesign Magic from the start, I would put countermagic and card-drawing into separate colors. I agree, the fact that blue has both is imbalanced. If the game were better designed, a deck-builder would face (more) tension in deciding whether to include countermagic and whether to include card-drawing. As it stands, these two themes are not in conflict, and in fact are complementary (particularly because the best countermagic card, Force of Will, demands other blue cards in the deck). This limits the space of viable deck design. But given that the mistake was already made decades ago of putting both into the same color, I think the dominance of blue is something we just have to accept. And if we accept that, I think we can independently ask the question of what cards are currently reducing the quality of gameplay (i.e., level of skill required), and how to reduce usage of those cards. In that light, I think Mental Misstep and Gitaxian Probe are two clear targets. There is precedent for the publishing of blue cards improving the quality of blue-vs-blue gameplay. 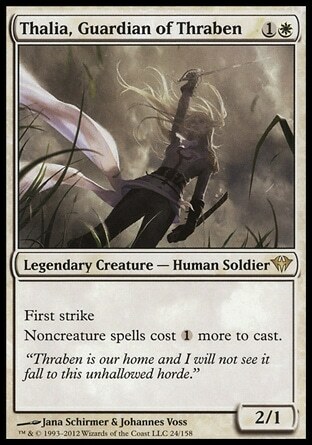 Dack Fayden made Tinker and Time Vault less viable, and those cards had reduced the quality of blue-vs-blue gameplay. So I think it is reasonable to try to design blue-deck cards to do to Mental Misstep and Gitaxian Probe what Dack Fayden did to Tinker and Time Vault. Your obsession with blue vs. blue gameplay is bizarre. And I don't think Wizards made specific blue cards with a purpose of "improving" blue vs. blue gameplay, so I wouldn't call it a "precedent." To double down on color imbalances in the game would be kind of absurd. Blue vs. blue gameplay is inherently low quality because it reduces the card pool almost 80% by removing 4 other colors. Like I said earlier, you would just be replacing blue cards with other blue cards, that doesn't sound like a massive quality improvement. Frustration is also the wrong word. It is not frustration with a color, it is the disappointment in flawed game design. In Vintage, I play Saheeli Oath, which has plenty of blue cards in it, and I beat Gush Mentor decks all the time. As a broad principle, I don't like reduced game design space that results when one color is so much better than the others, and the remaining colors don't have answer cards. Printing even more cards just for blue is irrational. Printing good cards in other colors is the right thing to do from a game design standpoint. And if the metagame becomes less blue vs. blue, then such interactions will become less frequent, less predictable, and their quality will accordingly increase. 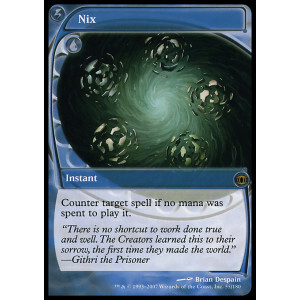 Should there be a Nix reprint as a cantrip? Would still benefit Blue players to play that card. Even against shops it's pretty good to counter a Mox and draw a card? I'd play at least 2 copies of that card in every Blue deck. Would probably replace Flusterstorm in many builds. @jhport12 I think the fact that others have suggested restricting Mental Misstep indicates I am not alone in thinking that improving blue-vs-blue gameplay is a good idea. Printing a card like my suggested one would cause running 4x Mental Misstep, 4x Gitaxian Probe, 4x Force of Will, 4x Gush to become too risky. So blue decks would need to replace some of those cards with other less efficient cards to compensate. This would dilute the power/consistency of blue decks, which in turn would increase the performance of non-blue decks. Again, to use the Dack Fayden example - it used to be that you needed to have answers to Tinker and Time Vault in your non-blue deck to compete. After Dack Fayden, this was no longer the case. The printing of that blue card diluted the power of blue decks, which in turn increased the performance of non-blue decks. I share your goal of wanting to diversify the metagame, which is precisely why I suggested the card I did. I think printing it will reduce the % of blue in the metagame. Printing better cards in other colors is another way of achieving this goal, but it is a dangerous way. If you print a red 3/3 first strike haste like you suggest, that messes with the Standard format. You can't print new cards that bypass Standard. Discussion about restricting Mental Misstep does not mean that other people agree with your obsession with blue vs. blue gameplay, unless they explicitly stated their reason is a concern for blue vs. blue gameplay. I don't know how you make such a logical leap that any discussion of one card means that other people believe and support your core premise. I haven't seen anyone other than you say that. There are many other arguments for why Mental Misstep should be restricted: after all, last time I checked other colors have 1-mana spells that they can't easily play anymore because of Misstep. I normally avoid topics like this as it makes little sense to me to speculate on cards WotC hasn't and likely will never print. That said, I have a question for the OP, @dshin: do you believe that printing overpowered, difficult to interact with hate cards for certain strategies leads to more interesting gameplay? Because I don't believe that. It turns MTG into the card game War with better artwork - we shuffle up our cards and hope the amount of hate we draw is greater than the number of answers that our opponent draws. There's no threat stratification, there's very little player skill outside of maximizing the probability we draw the appropriate cards using mulligans, card draw, and card manipulation, and the outcome between two competent players could be determined by a random number generator.